Queen of fun and girly designs, Betsey Johnson never fails to put a smile on my face. Her bright and bold designs add a touch of sunshine to my life. Why settle for boring and bland when you can have color and joy? Most people know her by her purse designs, but not many know about her equally cute and colorful luggage. About 99% of the world’s luggage is bland, usually black, and boring. Luckily Betsey Johnson has luggage for the rest of us that appreciate a bit of fun and whimsy no matter our age. 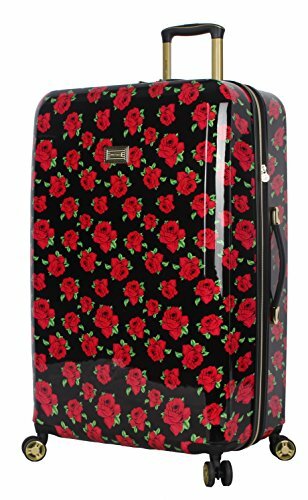 So let’s take a look at the Best Betsey Johnson Luggage available today. Each suitcase Expands by 2-inches by easily opening a zipper! 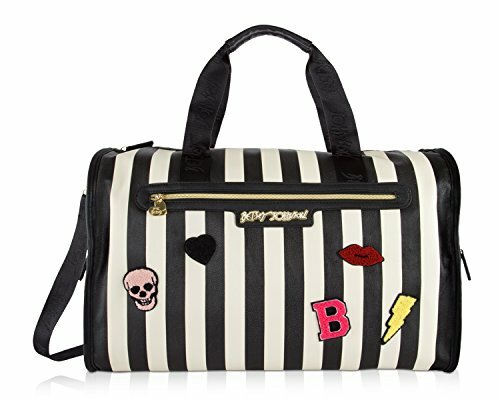 Betsey Johnson literally makes the cutest luggage. If you’ve been looking for that perfect luggage set, this one ticks all the boxes and more. It’s available in eleven sweet designs, so picking one may prove a little difficult. My favorite? The Striped Floral Hummingbird. I first saw it on the Betsey Johnson Instagram page and I was in love! In this set you get a Betsey Johnson Carry On, medium spinner suitcase, and large spinner suitcase. Having all three is convenient since you have choices as to which size you need. There are times when you need a simple carry-on and other times when you want a larger bag (or all three!). One great thing about Betsey Johnson luggage is how easy it is to spot at the airport. In a sea of boring, black, and characterless suitcases, this luggage will pop out. No more waiting at baggage claim and accidentally picking up a stranger’s similar-looking bland suitcase. I found each suitcase to be lightweight and easy to use. The top has a telescopic handle that pulls out for easy rolling. If you need to grab the suitcase from the outside, there’s a top handle and also a side handle for easy handling. Inside, there’s a generous main compartment that will hold all your clothes and shoes. It wouldn’t be a Betsey Johnson suitcase without even more patterns inside. 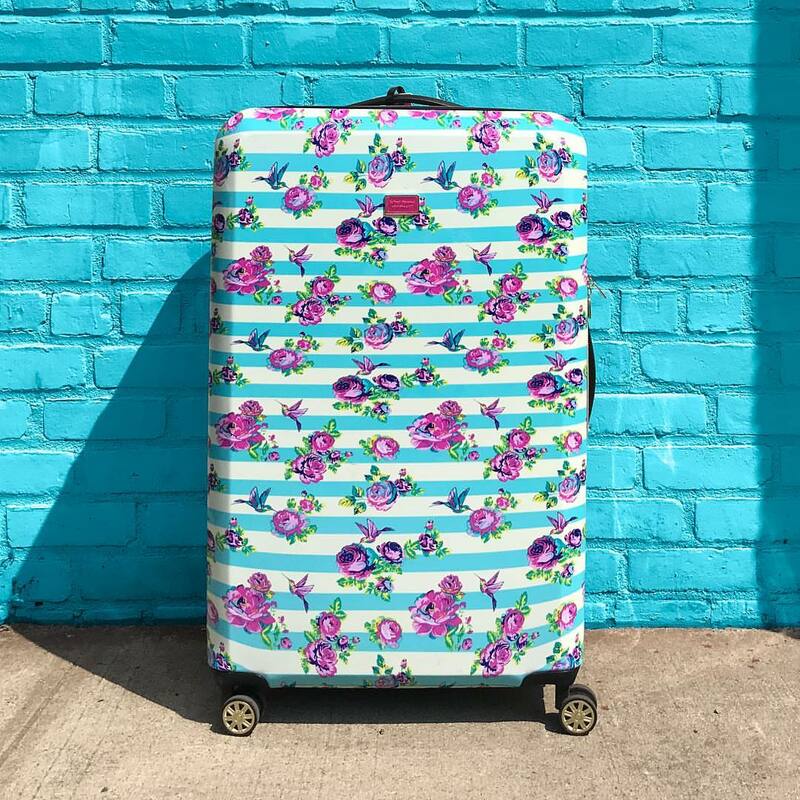 Each suitcase is lined with a bright and cheerful pattern that compliments the outside beautifully. It’s got a handy full-sized pocket inside the suitcase lid. I like to put my toiletries and other items I need quick access to in the lid’s large pocket. Opening the large pocket is easy and it opens and closes with dual zippers. Big enough to take on a weekend trip and pairs beautifully with your luggage for longer trips. 2-in-1 carrying options – use the easy hold grab handle or use the cross strap which is also detachable. Studded feet allow the bag to stand proud, without rolling over. It also protects the material from getting scratched. 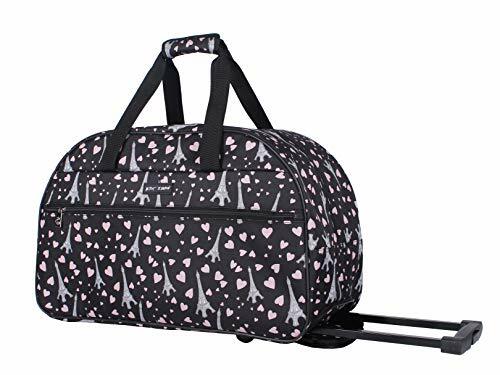 Whether you are taking a quick trip or travelling for several days, Betsey Johnson’s Weekender Bag is the perfect bag to bring along with you. It’s a medium-large bag that is a dependable size for any occasion. The bag features a convenient 2-way full-length zipper, that gives you instant access to your belongings. Once inside, you will find another Betsey Johnson design on the bag’s inner lining. This is a lovely touch that you usually get with more expensive bags. Inside the weekender bag, there’s a small zippered pocket which is great for your small items. I like to put my tissues, notebook, or anything else I want to grab quickly. There are also two slip pockets that can fit your cell phone or pens, for example. Outside, there are two zippered pockets, one on each side. When you’re travelling, it’s nice to have extra pockets to store your belongings. I usually put backup lipgloss and my charging cables in here. The weekender bag has two carrying options, depending on your preference. The grab handles on top are easy to hold and are flattened at the top for comfort. There’s nothing worse than holding a handle and it cuts into your skin. The other carrying option is to use the detachable shoulder strap. Some shoulder straps can be too thin and hurt my shoulder. This strap is wide and feels comfortable to wear, even when my bag is completely full. Using the shoulder strap makes it easy to travel hands-free. Best of both worlds – Duffle Bag and Rolling Suitcase! Sometimes a standard duffle bag or a suitcase will not do. 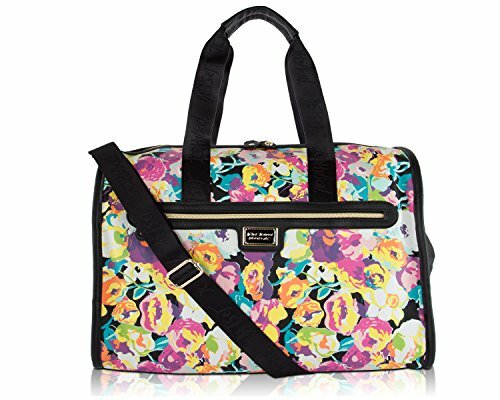 Combining the best of both worlds, the Betsey Johnson Wheeled Duffle Bag is a versatile piece of luggage to own. Aside from its practicality, the duffle bag is really cute too! This lightweight bag is not too big and not too small. 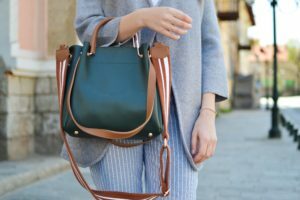 It’s the perfect bag to take on an airplane or for local trips. The size is just right for fitting on airplanes (21.5 x 14.5 x 10 inches). What I love about this bag is that the design maximizes the storage inside. Most suitcases take up a bit of space with their internal mechanics. However, this bag is just like a duffle bag (roomy, moldable), but with the added bonus of having a retractable handle and skate wheels for carrying. It will save your back if you need to travel with your duffle bag. For convenience, the duffle bag features a large-zippered pocket on the outside. It’s perfect for travel documents, books, magazines, anything else you need within reach. The inside features a pretty complimentary pattern and lots of storage. You’ll be surprised how much you can fit inside. With large bags like this, I make sure to use organizing luggage cubes to make sure everything is within reach. These luggage cubes are my favorite, by the way. 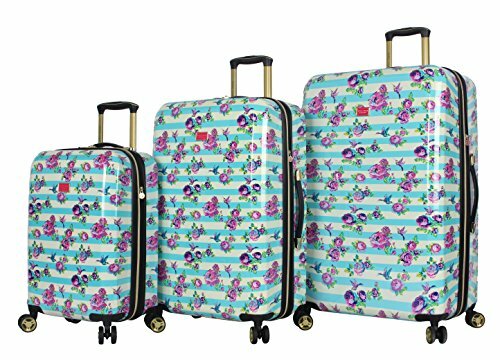 Part of Betsey Johnson’s popular hard-side suitcase range, this 26-inch luggage is the ideal bag if you want something not too small and not too big. It’s just the right size for 5-10 days of travel, depending on how much you pack. 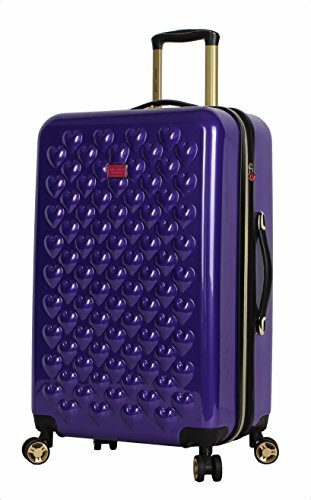 Like all of her fabulous designs, you will find this suitcase easy to spot from a mile away. It comes in handy when you’re waiting at baggage claim for your bag to appear. In a sea of boring, black, and characterless suitcases, this luggage really stands out. While everyone struggles to pick out which black suitcase is theirs, you’ll be halfway to your hotel! These days hardside luggage is very lightweight and durable and this is no exception. You’ll be able to squeeze in a lot of weight into this suitcase and stay within the airlines checked bag allowance. The average airline allows 50 pounds, you’ll have a little over 40 pounds to work with (the suitcase weighs 9 lbs.). Travelling with this suitcase is easy, thanks to its telescopic handle and 360-degree spinner wheels. When you’re travelling, you don’t want to be slowed down by a poorly designed suitcase that won’t spin around when you want it to. If you need to grab the suitcase from the outside, there is a handy top handle and also a side handle. It wouldn’t be a Betsey Johnson suitcase without even more patterns inside. The suitcase is lined with a bright and cheerful pattern that compliments the outside beautifully. Inside, there’s a generous main compartment that will hold all your clothes and shoes. For the gal who loves to bring every outfit, pair of shoes, and her beauty items, this is the suitcase to get. The large suitcase should fit almost any woman’s needs and if it can’t it will expand even more! One feature I love about this suitcase is that it is expandable. Simply by undoing a zipper, the luggage expands to give you two more inches in depth. It’s perfect for those last-minute items you need to pack. Thanks to it’s 100% polycarbonate design, this suitcase feels very light. Despite it its light weight, it is actually very durable. You’ll be able to fill this suitcase to your heart’s content, while keeping everything inside protected. The top has a telescopic handle that pulls out in three stages. It’s a good feature to have since you might be petite or above average height. Like all Betsey Johnson purses and luggage, there is a beautiful pattern inside the suitcase. The cheerful pattern compliments the outside beautifully. Inside the suitcase, is a handy full-sized pocket within the lid. The pocket itself has two compartments for optimal organization. You can keep shoes, toiletries and anything else you want quick access. The main suitcase area has a generous amount of storage and will hold all your clothes and shoes. Life is short, so get the prettiest, brightest things you can get. Betsey Johnson helps you achieve that by designing luggage that will make you smile. It might make someone else smile too. Who can resist a bright, cheerful suitcase? Not me. Are you a Betsey Johnson Fanatic? Let me know your favorite items in the comments.